Spent more time on the new blog template tonight. I’m basically going for the look of the Instapaper iPad app, but without all that Instapaper. Newest version is here. The great thing about minimalism is it’s pretty easy to do. Just keep it simple. I added margins between paragraphs, headers and line height so the text can breathe a little. Converted the text to serif fonts, which is a departure for me. I’ll try it for a while. The next step is converting it from static HTML to a WordPress template. I’m looking forward to getting this live. 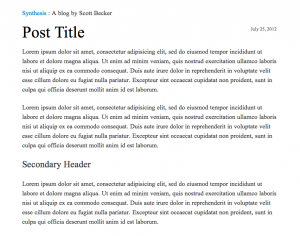 a nice blog template. look minimal and so cool. I like this blog template a lot Scott. If say, I were to begin a blog writing with words, could I use this as well? I would like to try. Well done. Sure! The template is available here.